In business, as in life itself, no project worth undertaking ever comes totally risk free. It's a sort of unwritten rule: if you want to reap the rewards of success, you also have to run the risk of failure. The bad news is that there are no exceptions - off-track projects can threaten budgets, custom relationships, profit and reputation. But the good news is that the greater the risk, the bigger the potential rewards. 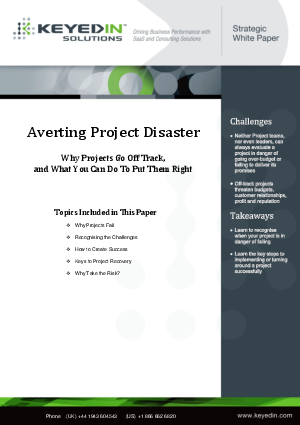 In this white paper you will find helpful guidance to learn how to recognize when your project is in danger of failing and the key steps to turning around a project successfully.